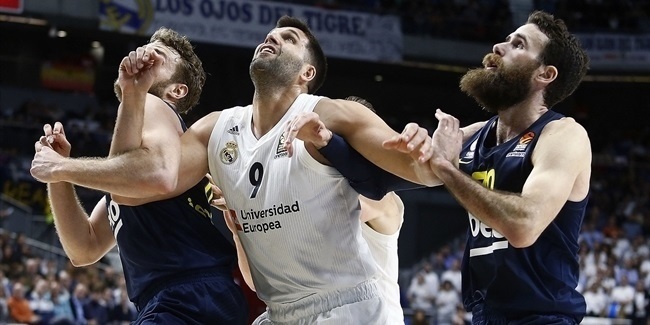 A pair of compelling road wins against previously unbeaten opponents produced twin bwin MVPs, Rudy Fernandez of Real Madrid and Fernando San Emeterio of Caja Laboral Vitoria, for Week 3 of the Turkish Airlines Euroleague Regular Season. The two Spanish national teammates tied with performance index ratings of 30 each, and since both of their teams won, they share the weekly honor. Fernandez was seemingly everywhere for Madrid in a huge 75-83 victory over Fenerbahce Ulker in Istanbul. 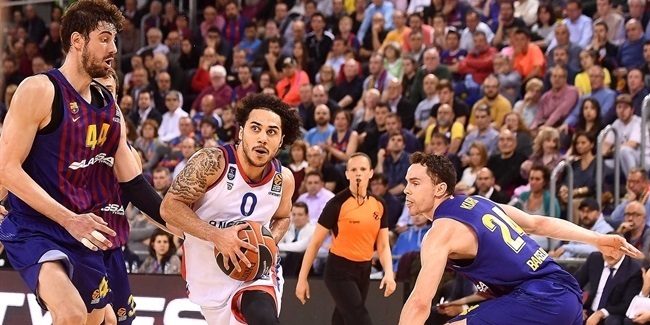 From rising high for exciting dunks, dishing to teammates for slams of their own or making game-changing blocked shots, Fernandez was Madrid’s go-to guy and finished with a team-high 21 points to go with 5 assists and 3 steals. His index rating of 30 was the best of his Euroleague career. San Emeterio was the steady hand needed to guide Caja Laboral to an 85-95 comeback win over EA7 Emporio Armani in Milan, Italy. He came through in a moment of truth for Caja Laboral, which was winless arriving in Milan and then lost team leader Andres Nocioni to a scary injury. San Emeterio strung together 18 points, 6 assists, 5 rebounds and 2 steals to make sure of Caja Laboral's first victory. The achievement marks the fifth time San Emeterio has been honored with the weekly MVP award. A player on the losing side in that contest, Milan center Ioannis Bourousis, was next on the list of the week’s top individual performances. Bourousis amassed 22 points on 9-of-12 shooting plus 11 rebounds for an index rating of 27. Rounding out the list of Week 5’s best are Panathinaikos big man Stephane Lasme and San Emeterio’s teammate Nemanja Bjelica, both with index ratings of 25. In his first full game for the Greens, Lasme roared with 13 points on perfect shooting plus 8 rebounds and 5 blocked shots. Bjelica set career highs with 20 points and 9 rebounds.MVP Video. The Euroleague's top scorers this week – Bourousis of Milan and Bobby Brown of Montepaschi Siena, with 22 points each – both happened to lose their games. After three weeks, Sonny Weems of CSKA Moscow has the highest scoring average with 20.3 points per game. Viktor Sanikidze of Siena was the week's best on the boards, with 13 rebounds, but he's second overall behind Aron Baynes of Union Olimpija, who averages 10. Jerel Blassingame of Asseco Prokom Gdynia dished 10 assists, the most of the week, to help his team get its first victory. He also leads the competition with 9.3 assists on average so far. Ricky Hickman of Maccabi Electra Tel Aviv and Ibby Jaaber of Zalgiris Kaunas stole 4 balls each, tops for the week. Hickman, Jamon Lucas of Anadolu Efes Istanbul and Dontaye Draper of Real Madrid share the top steals average, 2.7 per game. 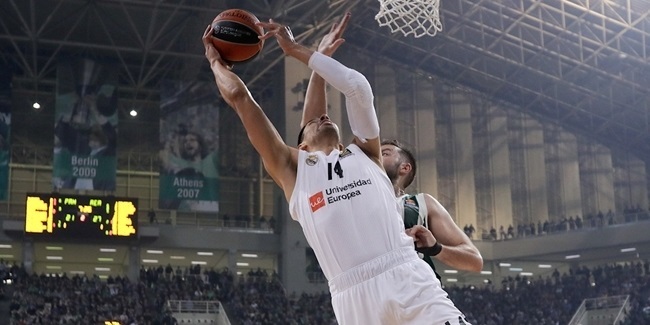 Lasme's 5 blocks for Panathinaikos matched his career high and made him the season's best so far, too, with 2.5 per game. Three players registered double-doubles this week: Bourousis of Milan (22 points, 11 rebounds), Blassingame of Prokom (16 points, 10 assists) and Viktor Khryapa of CSKA Moscow (10 points, 10 rebounds).